but I bet it sounds pretty in Italian." Whereas Italian writer/director Daniele Luchetti’s previous cinematic charmer Ginger and Cinnamon made the perfect foreign intellectual antidote to our superficial chick flicks (like Because I Said So), his follow-up film couldn’t be more different. Instead of a contemporary, female-driven romantic comedy like Ginger co-written by and starring his talented, high verbal wife Stefania Montorsi (think the Italian version of Said’s equally gifted Lauren Graham of Gilmore Girls fame), this time he sought inspiration from Antonio Pennacchi’s book Il Fasciocommunista. After receiving the prestigious “Un Certain Regard” from the Cannes Film Festival, the film also received nine nominations and five awards in 2007 at the Italian version of our Academy Awards — the Donatellos. 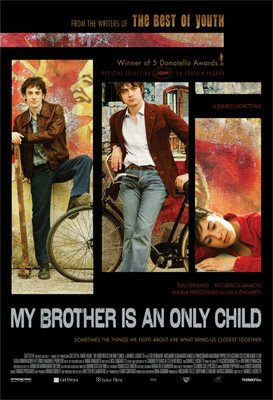 Recently released on DVD with zero features and barely visible, miniscule subtitles that cause eyestrain, My Brother Is An Only Child tells the story of two very different brothers coming of age in the 1960s and '70s amidst political upheaval. Although they find themselves on opposite ends of the party spectrum, which would be bad enough, it’s escalated when revolution breaks out and all the more so when they’re drawn to the same woman. If this sounds familiar to Italian foreign film lovers, it should (and not just to those who may have read the book with the daunting title). For Brother, Luchetti collaborated with the talented screenwriting team behind the structurally and thematically similar yet vastly superior 2003 miniseries The Best of Youth, which earned its place on numerous Top Ten lists that year of film buffs in the know. While at roughly two hours Brother can’t be as epic in scope as the six-hour Youth, it still pales in comparison to one of the best miniseries in recent memory, especially when the plots are so maddeningly similar that one can’t help but contrast and compare. However, the astute marketing team at THINKFilm tried to remedy this before Brother’s release by releasing a clever but misleading trailer. Although it still echoes Youth and does evolve into stirring melodrama near the end, complete with the swelling of a beautiful orchestra, the footage erroneously sets up Luchetti’s film to be far funnier and jovial than the end result. Thus, sort of pigeonholing the work into the ever-popular European genre of coming-of-age with a dysfunctional family and/or trying to break out of a relative’s shadow. And while incidentally Brother does include both of these plots along with the obligatory Jules and Jim-like love triangle for good measure, it’s a darker work than one would expect with characters that aren’t as likable as one would guess from the footage below. Yet, despite this and rather forced nostalgia which doesn’t come as naturally as it did in Youth, My Brother Is An Only Child is a work of the utmost quality. It chronicles the tale of the smart but bitter Accio (Ellio Germano) who has always been the family’s Jan Brady, next to his older, handsome, flirtatious, and mischevious brother Manrico (Riccardo Scamarcio), whose parents, neighbors, and beautiful girlfriend Francesca (Diane Fleri) act as though he hung the moon. While Manrico has become a veritable voice of the people with his growing involvement as a Communist spokesperson and lead protester — out of equal parts brotherly annoyance and feeling a kinship with the neighbors he seems to prefer to his own family — Accio joins the Fascists. Although predictably as events heat up and both get a glimpse of the best and worst of their parties, Accio has a change of heart and switches sides, things soon spiral out of control as the brothers begin to realize what’s really important and ironically adopt the best qualities of each other whether it’s Manrico’s bravery or Accio’s thoughtfulness. In the end, Luchetti offers us a truly memorable conclusion that admittedly made my appreciation for the film rise considerably. Depicting a stirring mini-revolution led by Accio on a much quieter yet more effective and smaller scale — with no violence and all soul — Luchetti manages to capture our hearts in a way that had been lacking for a better part of the picture and keeping it fresh in our minds long after we hit eject. Therefore with this in mind and given the stellar performances and production value, it’s recommendable on that level alone. And while no doubt, Brother would have benefited from larger and more legible subtitles, in between squinting at the text, Luchetti and company opened my eyes much wider to a political situation that most casual moviegoers wouldn’t normally see. While the radical and tumultuous era of the '60s and '70s have been well-documented in countless American films, they’ve mostly dealt with the situation either right here on our land or in Vietnam. More specifically, they've failed to explore what was going on in other countries with some of the riots in France in the late '60s or indeed the events in Italy depicted in this film and Best of Youth and for more knowledge of such, we must turn our attention towards international cinema (even when it arrives with a nonsensical name). And while Brother is an above average work, ultimately, for my favorite Luchetti film in recent memory, I’d still have to direct your attention to the appetizing Ginger and Cinnamon. Likewise, for those seeking a thematically similar yet infinitely more powerful depiction of the political scene of the era in Italy, movie lovers should look no further than the unforgettable Best of Youth, also available on DVD.